Ohhh, Chuck E. Cheese. If you were a child in the 80s or 90s, you can likely remember the joy, the excitement, and the thrill of this place. They had pizza. They had tokens and games and tickets. And the prizes, good grief, THE PRIZES. It was like heaven for kids. And now that I am on the other side of it, I know the dark, seedy side of the Chuck. Namely, that parents hate it as much as their kids love it. Not everything is awful about Chuck E. Cheese, of course. Their pizza has improved greatly, and the ball pits only exist in the nightmares of germaphobes everywhere. But as they have improved, we’ve noticed that their prices have crept slowly up. Which, if you’re trying to limit the amount of time you have to spend there, might be a good thing. But if you’re desperate to show your kids a good time, the cost of the place can be a problem. 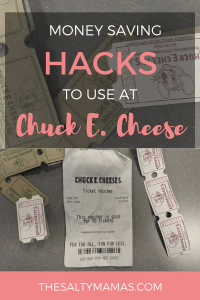 Lucky for you, we’ve scoured the internet and our local CECs to find the best collection of Chuck E. Cheese hacks, money saving tips, and upgrades to help make your trip to Chuck E. Cheese a little more bearable- or at the very least, a little less expensive. Every Chuck E. Cheese is different, but most of them have some kind of free-play option involved. Whether it’s a play structure, a ball pit (shudder!) or the dance area in front of the weird animatronic Chuck, there is usually a place you can corral your kids before things get real. You can cycle back through the free-fun again later, but some kids will be full-games-ahead once they start, so I like to delay using our Play Pass Points for as long as possible. I like to tell my kids that the games don’t open until you’ve been there for half an hour or so, until Chuck E. Cheese has done the ticket toss, etc. And Abe STILL doesn’t know that the motorcycle ride is anything but something to sit on, so play that card for as long as you possibly can. There is no hard and fast rule that you HAVE to eat at Chuck E. Cheese when you go there. Sure, the smell of pizza and the sight of people eating may be enough to throw your kids into tantrum-mode, but you can also focus on the allure of the games and fun to be had. Feed your kiddos before you go, and try to keep them from finding out that the pizza on the menu is actually for sale (see Lies We Tell Our Kids for ideas on how to make this happen. We tend to use the “They Only Sell Pizza on Tuesdays” line when we go). If that fails, know that the Dippin’ Dots are a lot cheaper than pizza, and see if you can get them to split a cup of that sweet, creamy goodness instead. If you must eat at the Chuck, try to hit up the weekday buffet. The price varies by location, but almost all locations have a lower price for kids. And as an added bonus, kids under three eat free. I usually eat before I go (pizza is not an ideal food for the gluten sensitive, as it turns out). So at my local CEC, I can feed both kids as much as they’d like for around $7 (including their favorite Caesar salad and some yummy dessert). That brings us to right around Happy Meal prices, and is SO much more exciting than your typical run to Mickey D’s. If you buy a drink as part of your meal, ask them if they offer a reusable cup upgrade. For an extra $1.50, you can trade in your unused paper cup for a plastic, refillable cup. They allow you to bring this cup with you anytime you come, so after your initial purchase, you can get free soft drinks with every visit. On days we skip a full meal there, we still bring our cups so the kids can sip a special drink as they play. Chuck E. Cheese offers an app-based rewards program that you can download on your phone. Not only do you get a free personal pizza for signing up (enough for the kids to split, getting you a free lunch! ), but you earn rewards for purchases. After every third visit (with a minimum $20 purchase), you’ll get $10 off your next purchase. And your child will get a little something to celebrate their birthdays and half birthdays. Sign up here to get your free personal pizza! 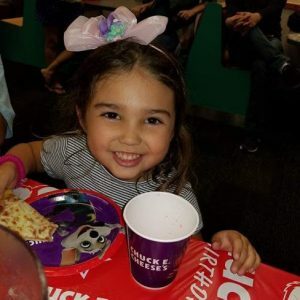 ChuckECheese.com has consistently great coupons on offer. You will find discounts on everything from full pizzas to token packages, and you just have to pull them up on your phone at the register. You may not find what you need on any given day, but it’s definitely worth checking before you head over. Pro Tip: You can also use the coupons if you go above and beyond what’s included in a party package, say by buying extra pizzas for the adults. Make sure to verify this with your local CEC before you go, but we’ve had it work for us at multiple locations! 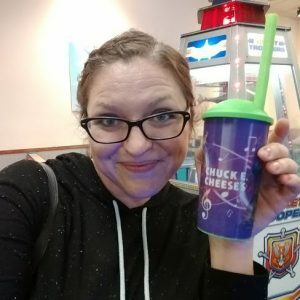 Chuck E. Cheese is active across social media, and you can sometimes find little hints, codes, or phrases that will get you added benefits. A few months ago, for example, you could get a voucher for fifty extra tickets if you mentioned that you were there for a “Fun Break.” Another time, you could extra Play Pass Points by mentioning that you saw Mario Lopez’s ad on Facebook. If you don’t have the time or the desire to follow them online, a quick google search should also show you what special deals may be available at any given time. Every few months, Christine buys about a million Play Pass Points and divides them amongst her children’s Play Pass Cards. It is a big expense when she does, but in the long run it is SO much cheaper than buying a few points every time you go. If you have wiggle room in your budget, it just makes sense to get them at the lower price point. If you are heading to the Chuck with a friend, consider splitting a Play Pass Points pack. There are often coupons available online, but they also get cheaper and cheaper the more that you buy. Bring along two or three friends to pitch in a $20, and score some cheaper Play Pass Points as a result. Sometimes, there are better deals to be had for a birthday party than for an afternoon of fun. Why not get a group together for a “birthday party?” With a basic package, every kid will get a few slices of pizza, a drink, and some tokens. You’ll get extra rewards if you book during a slow time of the day or week, and the kids will get a kick out of sitting in the birthday area. 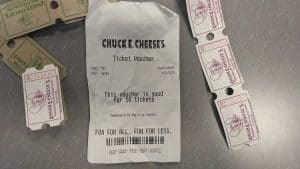 Instead of doing the ticket tornado, you can request a voucher for 1,000 tickets instead and get each of the kids a little something on the way out. Just make sure to collect money from your “guests” ahead of time so you don’t get the short end of the stick if someone cancels, and get ready to party! Trust us- this is SO WORTH IT. If we’re being honest, we kind of hate that they switched from tokens to electronic cards. It makes it so much less tangible- and so much harder to explain to kids! However, you can make it easier on yourself. They sell elastic bracelets that can hold the passes, or you can even attach them to an elastic hair tie. It’ll keep your kids’ cards separate from each other, and make them a lot harder to lose (that’s the hope, anyways!). Chuck E. Cheese himself comes out every hour at the :30 mark for a special dance, photo opps, and a ticket toss. We try to time it so we get there just before he arrives so that we can get a few more ticket tosses in before we have to go. It’s also a fantastic way to exit Chuck E. Cheese without tantrums. He often tosses the tickets into the air very near the ticket counter, so you can use the “wow, look how many tickets you got!” momentum to head right to the ticket muncher (does anyone else HATE the term ticket muncher as much as I do?!?) to cash in. 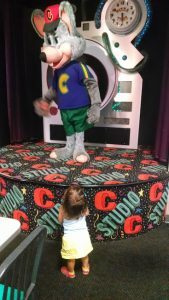 We can’t guarantee that these Chuck E. Cheese hacks will turn you into the mouse’s number one fan, but it can sure make the trip a lot more fun (and a LOT cheaper). What money saving tips for Chuck E. Cheese would you add to the list? Looking for more ways to save? Check out our Hacks for McDonald’s and Chick-fil-A (and try not to judge our dietary habits too hard in the process).